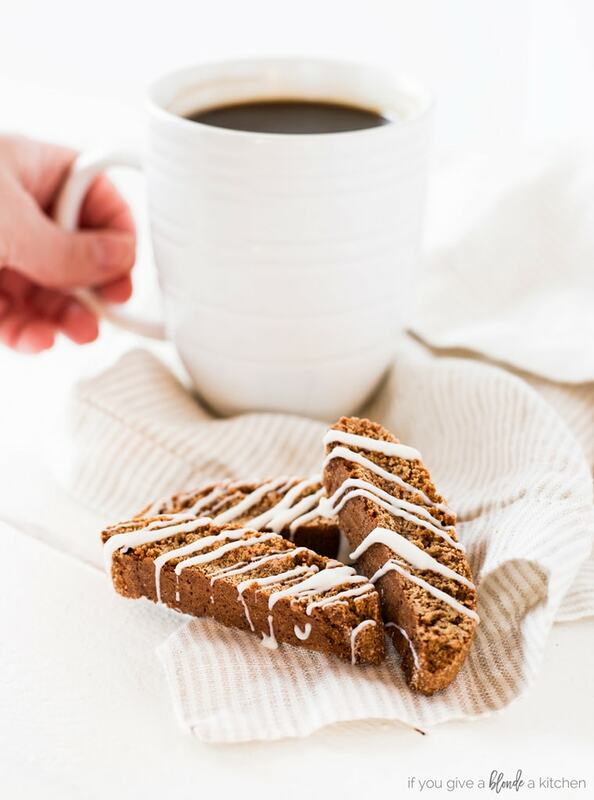 Gingerbread biscotti is a festive way to start your morning. Drizzled in white chocolate, this treat pairs well with hot coffee. Last night I was rummaging through my recipe books and bookmarked websites to decide what to bake for day 6 of the 25 Days of Baking. I settled on gingerbread biscotti, festive and something I’ve never made before. Plus, it gave me an excuse to write about the 4 months I lived in Italy. Scratch that. Picture this: I’m in the kitchen, I’ve got my ingredients out, Christmas In Connecticut on the TV and I’m ready to go. I’m adding my ingredients, following the instructions and notice the dough is a little dry so I add a few tablespoons of milk. Problem solved. I form the two logs, not so easily, but good enough. What do I know, I’ve never made biscotti before. Put them on the baking sheet into the oven. 30 minutes pass, take them out, cool, cut, put them back in the oven according to the instructions. I take them out, cool and taste. Something isn’t right. I’m wondering what went wrong. They aren’t very tasty to say the least. So I pull out the bible, Baking Illustrated , which I should have read prior to even starting this adventure. Let me first explain why I love this cookbook. The authors test multiple recipes for one certain baked good, say blueberry muffins, and write up the outcomes according to various ingredients—cake flour vs. all-purpose flour, frozen blueberries vs. fresh blueberries. Then they settle on the best recipe and publish their research and results in the cookbook. I love it. It’s easy to try a recipe you find on the internet, but it’s worth while to know why you’re using certain ingredients. 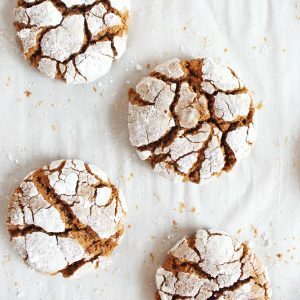 Anyway, here I am reading up on biscotti… some recipes call for butter, others for extra egg yolk, and then it hits me. I forgot to add the sugar. I mean, who forgets the sugar? Completely slipped my mind. That, my friends, is what happens If You Give A Blonde A Kitchen. I continued by telling my dog (no one else was home) how ironic it is that biscotti means twice baked because I will have to attempt to bake this recipe a second time. He was just hoping he would get the first batch that probably tasted like dog biscuits. After carefully adding the ingredients once more, the second attempt was a success. The whole house smelled like gingerbread. So don’t be afraid to try this recipe, just don’t forget the sugar. Preheat oven to 350º F. Line baking sheet with parchment and set aside. 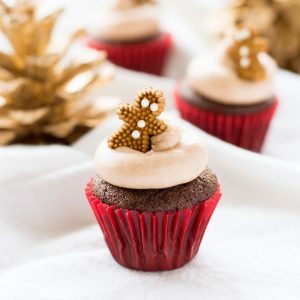 In a bowl, whisk together all the dry ingredients—flour, brown sugar, ginger, cinnamon, ground cloves, ground all spice, baking powder, baking soda, and salt. Set aside. In a stand mixer with a paddle attachment, mix together eggs, molasses, and vanilla until well combined, about 1 minute. Slowly add the flour mixture and mix until it forms a doughy ball, about 2 minutes.² Scrape the edges and bottom of the bowl if necessary. Flour work surface and transfer dough to the surface. Divide dough in half and form each half into a log about 10 inches by 2 inches. Place logs about 4 inches apart on the baking sheet and bake for 30-35 minutes, the surface will spring back when gently touched. Let cool 10-15 minutes. Once cooled, move log from baking sheet to cutting board. With a serrated knife, cut log into 3/4 inch slices on the diagonal. Place slices back on parchment lined pans, cut sides down. Repeat with second log. Bake 10 minutes, flipping biscotti over half way through. The baking time depends on how dry you like your biscotti. Longer baking time (15 minutes) makes a harder, crunchier biscotti. Let biscotti cool on baking sheet for 2 minutes then transfer to a wire rack to cool completely. Once cooled, use a double boiler or microwave to melt 1 cup white chocolate chips (see melting chocolate tips here). 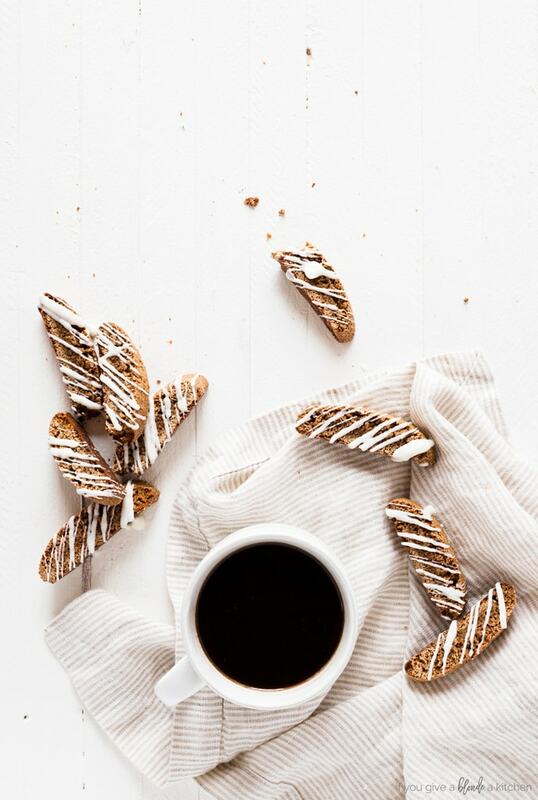 Use a spoon to drizzle chocolate over the biscotti. Allow chocolate to harden and enjoy with your coffee! I suggest using white chocolate melting wafers or adding a tablespoon of shortening to white chocolate chips when melting. It will help the white chocolate from becoming too stiff in the melting process. If the dough is too wet, like a cookie dough, add some flour 1 tablespoon at a time until it forms a ball. If it is too dry and crumbly, add some milk 1 tablespoon at a time. 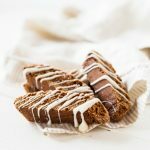 Store gingerbread biscotti in an airtight container at room temperature for up to a week. I guess it happens to the best of us! The gingerbread biscotti turned out lovely and tasted great with the white chocolate, too. I have Glee’s Christmas CD around here somewhere, I’ll have to listen to their cover! hee hee hee! It happens to all of us, or at least me, and I’m not blonde. It’s awful when you forget an important ingredient! These look absolutely gorgeous, by the way, for not have made biscotti before! Yum! These look so beautiful! Made these this morning, delish!! Went perfect with coffee by the fireplace on this chilly morning! Perfect! Thanks for the feedback, Stephanie! Yummy! <3 I want to have some, please. No problem, thank you for the inspiration! Hahaha! Can’t stop laughing! But we all have those days! You’re lucky to have the baking Bible to help you, that’s actually a book I need to get! About the gorgeous looking (as always) biscottis, they look divine! I love the drizzled white chocolate! These are our go to Christmas biscotti but we cut back on the spices and find we always need 1/4 cup more flour to get a dough ball. We also like longer, thinner cookies. 2×10 are too thick. Otherwise great recipe!